If Wildcat fans in 2016 felt that their team had had a rocky start, only to finish strong, they quickly found that 2016 was merely the dry run for the ultimate season turnaround. In 2016, NU started the season 1-3 and finished with a winning year, the first such turnaround for the 'Cats since 1970. In the middle of the 2017 campaign, the Wildcats found themselves saddled with a 2-3 record, sporting wins against bottom-feeding Nevada and Bowling Green, and a titanic loss to Duke, along with a winless skid to open Big Ten play. Northwestern then produced an eight-win streak that stretched from October to its victory over Kentucky in the Music City Bowl. It was the 'Cats' second straight bowl win, a program first, and its second straight season featuring a magnificent turnaround. It was also the third ten-win season during the Fitz era. The turnaround was fueled, in part, by the climactic performance of NU's all-time leading rusher, Justin Jackson. Jackson burned through the 2017 season with over 1300 yards on the ground, his fourth straight season with over 1000 yards rushing. He finished his career at NU with 5440 rushing yards, #1 in NU history and top-ten in NCAA Division I, all-time. After the 'Cats home-opening win against Nevada, the team traveled to Durham and was pounded by Duke, 41 to 17, in a game that wasn't as close as the score. One bright spot: linebacker Paddy Fisher notched 18 tackles against Duke and recovered a fumble. The redshirt freshman would go on to have 113 tackles in 2017, nine for loss. The Wildcats began their return to ten wins by taking down Maryland on the road and then peeling off a string of three straight overtime wins. The first OT win came against Iowa, a 17-10 triumph at Ryan Field in a game that paid tribute to late NU coach Ara Parseghian and his 1962 #1 squad. The following week NU stayed at Ryan Field and won a thriller against #16 Michigan State in triple overtime. It was the team's signature win for the 2017 season, and it featured outstanding performances by quarterback Clayton Thorson, who completed 33 passes for 356 yards and a pair of touchdowns; Jackson, who scored his 38th career touchdown (and had a spectacular, improbable touchdown pass), tying Damien Anderson's record; Fisher, who had 14 solo tackles and forced two fumbles; Joe Gaziano, who was a terrifying force in MSU's backfield; and Flynn Nagel, who had 87 receiving yards and a touchdown. In the third overtime session, Thorson rifled a pass to Nagel for the (ultimately winning) touchdown, and Cameron Green caught the pass for the two-point play. In MSU's last gasp throw, Nate Hall intercepted for the win. The 'Cats completed their OT hat trick the next Saturday in Lincoln by beating Nebraska 31 to 24 in a game that required only one overtime session. With the win, Northwestern became the first team in NCAA history to play and win three straight games in overtime. NU then claimed a pair of home wins, against Purdue and Minnesota-- the 39-0 victory against the Gophers was NU's first shutout in a Big Ten game since it blanked Minnesota in 2015. An easy win at Illinois closed out the season and set the 'Cats up for a showdown with Kentucky in the Music City Bowl. The bowl was close-fought, but Jackson's 157 yards and stellar performances on defense by Gaziano, Kyle Queiro, and Godwin Igwebuike put NU into the W column for the tenth time. Thorson received a serious injury in the first half, and was replaced by Matt Alviti, who led the 'Cats to the win with 50 passing yards and 54 rushing yards. With the win, NU carries an eight-game winning streak into 2018, the longest streak in the Power Five conferences. What follows are excerpts from a couple of my posts to this site during the course of the 2017 season. Please note that the comments posted below are only ones written by me, and this year I did not provide game previews or postgame commentary. Most of the articles on HailToPurple.com in 2017 came from other contributors. Northwestern has welcomed a new class of 19 scholarship recruits as part of signing day 2017 (including two students who have already enrolled). In addition to the new scholarship players, NU announced the addition of six walkons and a transfer student. This year, the class appears to lean to the defense and to the backfields: 10 of the 19 scholarship recruits are primarily defensive, and seven of them play in the linebacker or defensive back positions, while three are defensive linemen. On offense, the 'Cats appear to have eight recruits, with three offensive linemen and five offensive backfield players. NU has also recruited a kicker in the class. The 'Cats, bucking a geographic trend for the last few seasons, did not recruit a player from Pennsylvania; instead, five recruits come from Texas and Ohio each, and three new players come from Georgia. There are only two players from Illinois. The 'Cats new class received offers from the usual recruiting competitors, including Vandy, Wake Forest, Duke, the Ivy Leagues, Nebraska, and even Michigan and Ohio State. However, none of the class cross-recruited with Stanford or Notre Dame. Rivals did not give a four-star rating to any of the class; however, Scout gave a four-star rating to Trevor Kent and Sam Miller. Both Scout and CBS's 247 Sports awarded a four-star rating to Earnest Brown IV. Scout ranks the 2017 class 48th nationally, down ten places from the 2016 class. The ranking puts NU just behind Missouri, and ahead of Texas Tech and Iowa State. Scout has NU's class at 11th in the B1G, ahead of Wisconsin. Rivals ranks NU 55th (down from last year's 43rd spot), above Minny and just behind UCF. NU is 9th in the conference, just behind Iowa. CBS ranks the 'Cats 48th (the same spot as last year), and 11th in the B1G, ahead of Minny. The following table shows the list of recruits who have committed to Northwestern. The comments are compiled from material taken from Rivals.com, Scout.com, and CBS's 247Sports. Recruiting is always a somewhat challenging topic for me to cover. I have no interest at all in college recruiting. Yet, I recognize that success in recruiting is critical to Northwestern's program. For more detailed info and analysis, be sure to check out Lou V.'s reporting at Rivals and the work at Scout and CBS' 247 Sports. CBS and Scout 3-Star. Committed to NU Jan. 21. Scout and CBS 4-Star. Rivals 3-Star. Scout 4th in state. 25 offers, incl. Arkansas, Baylor, Col. Duke, Houston, Iowa, Michigan, Miss., Neb., Ohio State, OK, Texas, A&M, Vandy. Scout, CBS, and Rivals 3-Star. Scout 1st in state. Rivals 2nd in state. 11 offers, incl. BC, Cal, Duke, Neb., NC, Pitt. Scout, CBS, and Rivals 3-Star. Scout 1st in state. 8 offers, incl. Illinois, 'Cuse. Scout, CBS, and Rivals 3-Star. Scout 4th in state. 11 offers, incl.Baylor, Brown, Columbia, Dartmouth, Penn, SMU.. Scout, CBS, and Rivals 3-Star. 13 offers, incl. BC, Columbia, Harvard. Scout, CBS, and Rivals 3-Star. 11 offers, incl. Army, Columbia, Cornell, Harvard, Wake. Scout, CBS, and Rivals 3-Star. Scout 3rd in state. Rivals 21st in state. 9 offers, incl. WMU. Scout 4-Star. Rivals and CBS 3-Star. Scout and Rivals 1st in state. 12 offers, incl. K-State, Michigan, Minny, Mizzou, Neb, OK, PSU, Vandy. CBS 3-Star. Iowa State also offered. Scout and CBS 3-Star. Scout 3rd in state. Miami O., WMU, EMU, Toledo offered. Scout, CBS, and Rivals 3-Star. Scout 1st in state. Rivals 33rd in state. Ball St., BG, Harvard, Yale, Miami O., Toledo offered. Scout 4-Star. Rivals and CBS 3-Star. Scout 2nd in state. 7 offers, incl. Indy, TX Tech. Scout, CBS, and Rivals 3-Star. Scout 9th in state. 18 offers, incl. BC, Duke, K-State, M'land, Minny, Vandy, Wake. Scout, CBS, and Rivals 3-Star. Scout 4th in state. Rivals 20th in state. 17 offers, incl. Arkansas, Cincy, Duke, Illinois, Indy, Michigan, Mizzou, PSU, Pitt, 'Cuse, Wake. Scout, CBS, and Rivals 3-Star. Scout 1st in state. Scout, CBS, and Rivals 3-Star. Scout 9th in state. Illinois, KS, Rice, SMU, Wyo. offered. Scout, CBS, and Rivals 3-Star. Scout 1st in state. Rivals 5th in state. 15 offers, incl. Army, Harvard, L'ville, M'land, Navy, Pitt, 'Cuse, Wake. Rivals state ranks include all positions. Scout state ranks are position-specific. The 'Cats also welcomed wide receiver Jalen Brown, a graduate student transfer from the University of Oregon. While at Oregon, Brown notched 407 receiving yards and four TDs during two seasons with the Ducks. The Era of Ara closed for good today. Ara Parseghian, Northwestern's legendary football coach who went on to win a pair of national championships at Notre Dame, died early today after a brief illness. He was 94 years old. Parseghian was one of several Wildcat coaches who came from Miami of Ohio, the cradle of coaches-- not only for the nation, but NU specifically-- and he took a stagnant NU program and propelled it to #1 in the country. He is considered one of the greatest coaches in Northwestern history. As a player in the NFL, Parseghian played for Paul Brown (who also launched Otto Graham's professional career), and then returned to Miami, his alma mater, to support head coach Woody Hayes. Parseghian took over for Woody at Miami in 1951, and during his five-year tenure as the Redskins' head coach, Ara crafted a reign of terror through the MAC, going 39-6-1, including his final, undefeated 1955 masterpiece of a season. 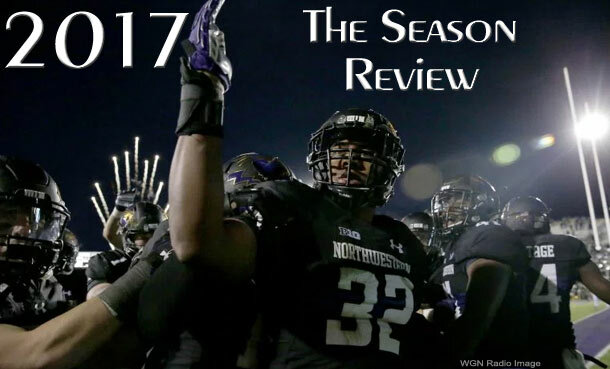 That last season began with a 25 to 14 slap-down of Northwestern at Dyche Stadium. The Wildcats were winless and hapless that season, but their 14 points were the most that Miami were to give to any team: the Redskins outscored their opponents 226 to 47. Northwestern, in a tailspin during Lou Saban's only year as head coach, cleaned house at the end of the '55 season, ousting Saban and his staff (including future Yankee owner George Steinbrenner) and hiring Parseghian from Oxford (Parseghian's replacement: John Pont, who would also find himself in Evanston in 1973). It took Ara two years to rebuild Northwestern's program, and he began a relentless national recruiting effort, bringing in top talent, including All-Americans Ron Burton and Jack Cvercko, along with Irv Cross, Fred "The Hammer" Williamson, and-- in the sixties-- Tom Myers and Paul Flatley. The Era of Ara became a national phenomenon in 1959. That season, NU-- just two seasons removed from a winless campaign-- opened the year ranked in the top ten. The '59 season kicked off against Oklahoma, the #1 team in the nation and the most dominant team of the fifties: the Sooners had won 107 of their last 117 games. Parseghian's squad, however, routed Oklahoma at Dyche Stadium, 45-13, and captured the #2 spot in the nation. Later that season, Parseghian would face Notre Dame for the first time. The 'Cats had not played the Irish since 1948, and Notre Dame had won the last eight games vs. NU. the '59 'Cats, however, upended Notre Dame 30 to 24. Parsheghian would go on to establish himself as the master of the NU - Notre Dame series: he went 4-0 in the series as NU's head coach, then 9-0 in the series heading the Irish. Tough campaigns in 1960 and '61 were followed by Ara's high-water mark in Evanston: a 7-2 run in 1962 that featured Northwestern swamping Notre Dame at Dyche Stadium, in front of a record crowd, to capture the #1 ranking nationally. It was NU's first #1 ranking since 1936, and the last time that the 'Cats would reach the top of the polls. Parseghian's NU team finished the 1963 season at 5-4, featuring impressive victories at Missouri and at Ohio State. The win over the Buckeyes, the season finale, gave Ara a 36-35-1 overall record as head coach at Northwestern. Parseghian would be the last coach with a winning record in Evanston until Pat Fitzgerald. After the '63 season, Parseghian's relationship with the NU administration became frayed, and, when asked about his status at NU, Parseghian famously and tersely responded, "I'm restive." Unfortunately, Ara was too restive, moving on to Notre Dame within weeks. While in South Bend, Ara took the Irish to two national championships, in 1966 and 1973, retiring in '74. He went on to provide broadcast commentary and was famously involved with funding for medical research for Niemann-Pick Disease, which had claimed three of his grandchildren. Coach Parseghian returned to NU in 2010, to be honored by the team and the school. It was homecoming, and it was a special homecoming for NU's renaissance coach, a great man and a coach whose work at Northwestern was sterling but half-finished, with a record that was great but only hinted at what could have been, had NU prized Ara during his era as much as it prized him in this last decade. We're wrapping up summer, and the annual college football magazines have appeared at the newsstands, offering their picks and predictions. The slate of previews typically begins with Athlon and Lindy's and concludes with the Big Ten's August media event, when the conference announces its official front runner. HailToPurple has tracked the media previews and predictions since the 2000 preseason, and regular readers might be familiar with the HTP "Heinz Line": most media attempts to rank NU nationally in the preseason used gravitate toward 57th place, until recently. Last year the media actually nailed a prediction during a season when NU finished well above the Heinz Line. Since 2010, media predictions have underpredicted, overpredicted, and come out accurate nearly the same amount. For 2016, the media licked its wounds from seriously underestimating NU in 2015, but they did not over-correct; instead, most prognosticators took an even-handed approach to assessing the 'Cats. The media came very close to predicting NU's performance. Most sources actually had a nearly spot-on assessment. The closest, for the second year running, was CollegeFootballNews.com, which called the 6-6 regular season record, and a loss to WMU. There was no "dog" pick last year, although the Orlando Sentinel was perhaps too optimistic in its predictions. During every summer since 2000, HailToPurple.com has posted a recap page of what the larger 'Net and print publications predict for NU. Here are the 2017 Wildcat predictions so far. Since it holds the crown for most accurate prediction for the past two years, let's begin with CollegeFootballNews.com. In its power rankings of the B1G, CFN places NU in fifth overall, second only to Wisconsin in the West. "The combination of Clayton Thorson at quarterback and Justin Jackson at running back is one of the best in the league. BUT... it's frickin' Northwestern, so it could lay an egg a few times this season and get it all over my face." The power rankings are very different from CFN's predicted finish, which has NU in a lousy fifth spot in the West, behind Wisconsin, Iowa, Nebraska, and Minnesota. CFN predicts that the 'Cats will run its non-conference slate, and then lose their next three games (including their first road trip to Maryland), finishing with an embarrassing loss to Illinois. CFN then ranks NU 35th in the nation. A perplexing view. Moving on to the print picks, Lindy's is one of the most overreactive when it comes to NU: after a bad season, the mag will expect similarly awful results from NU the next season, and it will be just as bullish after a good year. In the wake of NU's bowl win vs. Pitt, Lindy's now ranks NU 21st in the nation, and second in the B1G West, behind the Badgers. Lindy's has tabbed Jackson All-Big Ten and the seventh best running back in the nation (no Heisman mention, though). Lindy's is really high on the Thorson/Jackson combo: "on paper, this could be Pat Fitzgerald's best team." The second major national preview magazine is Athlon, and it takes a dimmer view of the 'Cats, placing them 41st in the nation (but still second in the West, trailing Wisconsin). Athlon predicts NU will go 8-4, 5-4 in the B1G, and will play Oregon in the Holiday Bowl. It ranks NU's running backs 11th in the country and the D-backs 16th. Jackson is on the magazine's Heisman watch list. In his preseason mag Phil Steele is aligned with rest of the print sources, spotting NU second in the B1G West behind the Badgers. Steele ranks NU 28th overall, ahead of UCLA and Tennessee, and just behind NC State and BYU. Internet statistician and ranking mogul James Howell has been offering his rankings and game predictions for many years. For the 2017 pre-season his power rankings slot NU at 47th, good for ninth in the B1G. Internet source The Power Rank builds a predictive model for all Div. I teams. For 2017, The Power Rank ranks NU 32nd, a significant jump from last year's 58th spot. The Power Rank is high on Iowa, placing the Hawkeyes (and, of course, the Badgers) above NU, slotting NU third in the West and sixth in the B1G overall. The Sports Formulator, another model-based Internet source, is also more optimistic about NU than it was last year. The site ranks NU 40th, and-- like nearly all sources-- puts NU second in the B1G West. The Sports Formulator's models predict that NU will wind up with a 9-3 record, with an impressive 6-3 conference mark. According to the site, that should land NU in the TaxSlayer Bowl. Another Internet prognosticator is Mike DeSimone, who has NU in 32nd, just above North Carolina. Among newspapers, the Orlando Sentinelis one that provides a detailed preseason rank of all teams. The Sentinel ranks NU 29th, second in the West, and fifth overall in the B1G. "The deep, experienced Wildcats should be in the mix for a Big Ten division title." Bill Connelly posts on SB Nation, and his preseason B1G power rankings placed NU at 38th nationally, sixth in the B1G, and third in the West, behind the Badgers and Nebraska (Iowa lags at 52nd nationally). SB Nation's Jason Kirk posts preseason bowl projections, and he has picked NU to play in the Music City Bowl vs. Texas A&M. The Sporting News has been absorbed in 2017 by an older football print publication, Street & Smith's. S&S has a somewhat mixed pick for NU in '17: the 'Cats are only 4th in the B1G West (behind Wisconsin, Iowa, and Nebraska), but the magazine also ranks NU third on its list of the most underrated teams in the country. S&S only ranks the top 25 teams; with its place in the B1G West, NU didn't make the list. Justin Jackson is on S&S's (rather long) list of Heisman hopefuls, and the publication predicts that NU will play in the Holiday Bowl vs. Utah. CBS Sports released its national preseason ranking on August 26, and the Tiffany network placed NU at a relatively high 30th, good for fifth in the conference and second in the West. CBS's Jerry Palm projects that NU will face Kentucky in the Music City Bowl. USA Today's Paul Myerberg made predictions for the win-loss records of all 130 FBS teams. Myerberg predicts that NU will finish behind Wisconsin and Nebraska in the West, with an overall record of 8-4, and a B1G record of 5-4. The major polls have been released for the preseason, and NU is unranked. The 'Cats pulled in 25 points in both the AP and Coaches Polls. Ed. note: At the end of every year, we go back to the preseason media predictions and call out the most and least accurate. For 2017, and the second straight year, the media were fairly accurate in predicting NU's performance. Several sources had very close predictions, including Lindy's and Sports Formulator. There is no "dog" pick again this year, although James Howell's model was off by a bit. CollegeFootballNews.com's predicted finish was perhaps the closest to a dog pick in '17. The return of the Fighting Irish to Evanston is still a year away, but it's not too early to plan for NU's uniform. While a case can be made to use the team's standard uniform, this game seems like a good time to make a statement, reinforcing NU's claim to be Chicago's Team. It would also be a great time to bring back the team's excellent Gothic unis, which haven't been worn by the football team since 2015. The suggested helmet would be black, with a faint pattern of brickwork and ivy, similar to the sleeves of the 2014-2015 gothic jersey. The uniform would bring in to play the gothic Northwestern elements and, for the first time, Chicago symbolism as a major part of the uniform. As a once in a blue moon uniform, it would provide a strong reminder of NU's history and tie to the city. For the first time since the 2016 Outback Bowl, Northwestern football is ranked. NU cracked the newest College Football Playoff Top 25 Ranking at #25, despite only netting six points in the most recent AP Poll, and only five in the Coaches Poll. 2017 is the 32nd season in the history of the program that the team has been ranked for at least one week. Northwestern held on to beat Kentucky, 24-23, in the Music City Bowl, claiming first-ever back to back bowl wins for the program and its tenth win for the season. 2017 is the third ten-win season during Pat Fitzgerald's time as head coach, and his fourth as part of the program. The only ten-win season for NU that did not involve Fitz was in 1903. The game began inauspiciously for NU. The (Blue) Wildcats scored on the opening drive in just over two minutes, and the teams settled into trading punts before Northwestern got onto the scoreboard with a 33-yard field goal. Early in the second quarter, NU had the ball at midfield, and Justin Jackson tore through the Kentucky defense to bring NU within field goal range. On first down at the Kentucky 29-yard line, Clayton Thorson handed the ball off. Jeremy Larkin then lobbed a pass back to Thorson, who completed for first and goal. However, Thorson injured his right knee on the play, was sent to the sideline, and Matt Alviti stepped in to quarterback the remainder of the game. An MRI later confirmed that Thorson tore his ACL and will require surgery in January. With the (Purple) 'Cats positioned at the Kentucky five-yard line, Jackson plowed past the goal to give NU a 10-3 lead, and the team kept that lead for the rest of the game, though with considerable difficulty. The game's refs became a significant part of the story, and a chaotic one at that, ejecting players on both sides and unloading a series of questionable calls against both teams. The wildest penalty came during the second quarter of the game, when an official offered to help Kentucky running back Benny Snell, Jr., back to his feet after a tackle. Snell, declining the help, moved the officials hands out of the way, and was promptly flagged for "initiating contact with an official," which removed him from play. Soon afterward, NU linebacker Paddy Fisher got ejected for targeting, despite all replays of the play apparently showing a perfectly legal tackle. The loss of Fisher, combined with the earlier loss of linebacker Nate Hall (to injury), put the Northwestern defense on its heels, joining the offense-- now led by Alviti, who had not thrown a pass in competition since early October. Fortunately, both Alviti and the defense stepped up, trusted themselves, and kept NU in the lead. By the middle of the third quarter, Kentucky was again down by just three, 17-14, and was driving. However, Kyle Queiro took a Stephen Johnson pass the other direction, notched a pick six, and provided arguably the most important play of the day for Northwestern. The ten-point lead almost proved insufficient. With less than five minutes to go, Kentucky made a 48-yard field goal. NU's next drive stalled at its own 39 yard line. With fourth down and one yard to go, the Purple Wildcats rolled the dice, Alviti attempted to haul the ball across, and NU was stopped on downs in its own territory. Kentucky moved the ball to the nine, at which point Johnson kept the ball and raced in for what appeared to be the tying score with 37 seconds left. Kentucky, at the tail end of a wild game and a slug-fest of a second half, decided to end the game then and there, going for two, rather than playing for overtime. Johnson fired a pass that fell to the turf, and NU white-knuckled its way to its third bowl victory in the Fitz era. Jackson, NU's all-time rushing leader, cracked the top-ten all-time rushing leaders in NCAA history during the game, picking up 157 yards and a pair of touchdowns along the way.